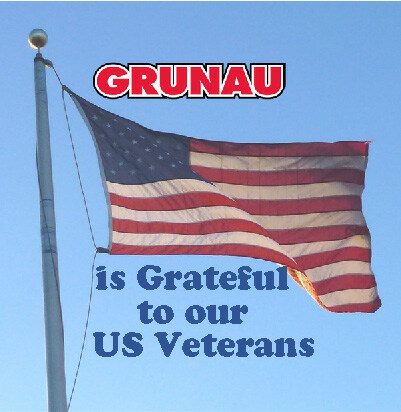 Honoring Employee Veterans | Grunau Company, Inc.
Grunau is honoring our employee veterans as America celebrates Veterans Day on November 11. Grunau hosted a social hour after work for our Milwaukee-based US military veterans at the nearby Milwaukee Burger restaurant. Over 30 veteran employees attended the event. President, Bill Ball, who himself is a veteran, offered a toast of gratitude for the veterans’ service to our country. Special hard hat stickers were also distributed to wear proudly on Grunau’s construction jobsites. Grunau’s community focus reached to participation and support of Milwaukee’s 4th Annual Military & Veterans Ball. The ball is hosted by Milwaukee’s Military and Veterans Resource Center (MAVRC) at UW Milwaukee. The event celebrates the service of our military and veterans as it kicks off Veterans week. 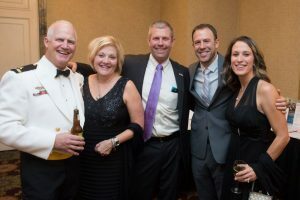 Several Grunau leaders attended the ball and veteran employees were also encouraged to attend. Grunau participates in the Veterans In Piping (V.I.P) program which is aimed at addressing the growing shortage of skilled workers in the pipe trades, while tapping into a capable resource. Grunau Company Inc. is an Equal Opportunity Employer including Disabled, Veterans, Females and Minorities. In addition, Grunau participates in APi Group’s Leader Development Program (LDP). The company has found military veterans to be a rich source of people who demonstrate superior leadership potential. Each candidate spends the first year with APi Group on multi-week company rotations throughout the country. The LDP’s are given special projects to work on during their rotation. Especially relevant, they shadow leaders to help develop skills for future success in the APi Group environment. Following the first year, a candidate is placed in a position with one of the APi Group companies. Grunau currently employs three veterans who have participated in the APi LDP program.